building, now used by the Children's Museum of Pittsburgh. It was 165 years ago today (1851 January 8) that Jean Bernard Leon Foucault of Paris invented an instrument that would provide a conclusive physical demonstration that the Earth rotates on its axis. In fact, January 8 is now known as Earth's Rotation Day. The fact of Earth's rotation was known well before the 19th century. However, it was the Foucault Pendulum that physically demonstrated this fact for the first time, using laboratory-type apparatus rather than astronomical observation. A Foucault Pendulum is any pendulum that is designed to demonstrate the rotation of the Earth. A small model of a Foucault Pendulum may be used to simulate a larger Foucault Pendulum. Typically, a Foucault Pendulum is composed of a fairly long wire (the longer the wire, the easier to observe the Foucault Pendulum effect) with a heavy Pendulum Bob at the bottom of the pendulum. The Foucault Pendulum is started swinging in one direction, and often an electromagnetic device at the top of the Pendulum Wire briefly attracts the wire to keep it from slowing down, but without disturbing the direction of the swing. The Pendulum Bob then, periodically, knocks down small pegs or pins as the Foucault Pendulum appears to change direction of swing. When any pendulum begins swinging, the motion or direction of swing of the pendulum always remains the same; the swing never moves or changes direction of swing unless directly affected by an outside force. By the constant swinging in one direction, and one direction only, this is how a Foucault Pendulum can demonstrate the Earth's rotation. Over a time period, an observer watching the swing of the pendulum would note that the pendulum's direction of swing appears to change in reference to the observer. However, the direction of swing of the pendulum has not changed; it continues to swing in the same direction as when it started swinging. What is actually happening is that the Earth is rotating the floor beneath the pendulum, and the observer is also moving with the floor, causing the observer to detect an apparent change in the direction of pendulum swing. Thus, knowing that a pendulum swing is always in the same direction, unless directly acted upon by an outside force, it is clear that the floor is moving beneath the pendulum and hence, the Earth is rotating on its axis. Mr. Foucault first built a Foucault Pendulum in his basement, early on the morning of 1851 January 8. On 1851 February 3, he demonstrated his new device to other scientists in the Meridian Room of the Paris Observatory. On 1851 March 31, French President Louis Napoleon (a Science buff) arranged for Mr. Foucault to give a public demonstration of his new pendulum under the roof of the Pantheon in Paris. The public was enthralled by this demonstration. President Napoleon, who soon became Emperor Napoleon III, gave Mr. Foucault the position of Physicist Attached to the Imperial Observatory. Jean Bernard Leon Foucault was actually a citizen-scientist, when he created the Foucault Pendulum. Although originally studying medicine, he gave up a medical career when he realized he could not stand the sight of blood. He worked as a lab assistant and on-his-own studied Science and tinkered with new technologies such as photography. For a couple centuries, scientists had been trying to devise a way to physically demonstrate that the Earth rotates on its axis. They had tried dropping objects from tall towers, to measure a drift in their fall due to the planet's spin. However, these experiments were too crude, with too many interfering variables, to be conclusive. So, professional scientists were not, at all, happy when a citizen-scientist discovered a simple and elegant solution to this problem. In fact, Mr. Foucault was rejected several times for membership in the French Academy of Sciences, before finally receiving admission to the Academy in 1865, three years before his early death at age 49. According to Jean Bernard Leon Foucault's journal, he invented the Foucault Pendulum at 2:00 a.m. In honor of Mr. Foucault, this blog post has been posted precisely at 2:00 a.m.
Today, Foucault Pendulums can be found in many planetaria and Science museums, throughout the world. A Foucault Pendulum can also be found in, at least, one Children's Museum (in the historic Buhl Planetarium building, as part of a complex of three historic buildings now operated by the Children's Museum of Pittsburgh) and, at least, one public library (Rotunda of the Central Library of the Lexington, Kentucky Public Library). Buhl Planetarium's historic Foucault Pendulum started its public display on 1939 October 24, with the formal dedication of The Buhl Planetarium and Institute of Popular Science. The weight of the Pendulum Bob (weight at the lowest end of the Pendulum Wire) used on this Pendulum is 150 pounds. The Pendulum Wire, which holds the Pendulum Bob for Buhl Planetarium's Foucault Pendulum, is 35 feet in length. This steel wire was produced at the Jones and Laughlin Steel Mill on the South Side of Pittsburgh. A special truck permit was required to transport this 35-foot steel wire, completely straight (coiling the wire could have produced a bias in the pendulum's swing), to Buhl Planetarium's North Side location. For a Foucault Pendulum's swing (in the Northern Hemisphere) to appear to make a complete clockwise revolution around the compass below the swing (as the Earth, underneath it, moves counter-clockwise, or from west to east) depends on the Pendulum's location on the Earth; it takes longer, the further the pendulum is located away from the poles. If the Foucault Pendulum is located at the North Pole or South Pole, it would take 24 hours. At the Equator, there would be no observable shift in the direction of the pendulum's swing, while south of the Equator the pendulum would appear to shift the swing in the opposite direction (counter-clockwise). For Pittsburgh's Foucault Pendulum, at +40 degrees North latitude, it would take about 37 hours for the apparent shift of the pendulum swing to finish one clockwise revolution around the compass below the pendulum. The pendulum's apparent shift is 10 degrees per hour. The pegs, set-up along the cardinal points of the compass below the pendulum, were usually set-up 2.5 degrees apart, resulting in one peg being knocked-down by the Pendulum Bob about every 15 minutes. For some of the years when the Buhl Planetarium building was not being used (1994 to 2004), this Foucault Pendulum was displayed on the second floor of Pittsburgh's Carnegie Science Center. On 2005 February 23, the Children's Museum of Pittsburgh re-dedicated this Foucault Pendulum, in the original brass and marble Pendulum Pit of the Buhl Planetarium building, now used by the Children's Museum. A large Foucault Pendulum was displayed for many years in the Smithsonian Institution's National Museum of American History in Washington. In late 1998, this Foucault Pendulum was removed to make room for the Star-Spangled Banner Preservation Project. Regrettably, this grand Foucault Pendulum remains in storage with no current plans for it to be re-installed. Jean Bernard Leon Foucault, near the end of his life, also invented the Siderostat-type Telescope. In such a telescope arrangement, the telescope is mounted, horizontally and permanently, on concrete piers; the telescope does not move, save for the movement of the Earth. A flat, first-surface mirror, mounted on a Sidereal Coelostat (a.k.a. Siderostat) unit feeds light from the sky into the telescope; with a motorized clock-drive the mirror can follow a celestial body, feeding the light from the body continually into the telescope. Mr. Foucault passed-away before he had a chance to build such a telescope. However, a small one was built shortly after his death, and a very large one was built for a Paris exhibition in 1900. 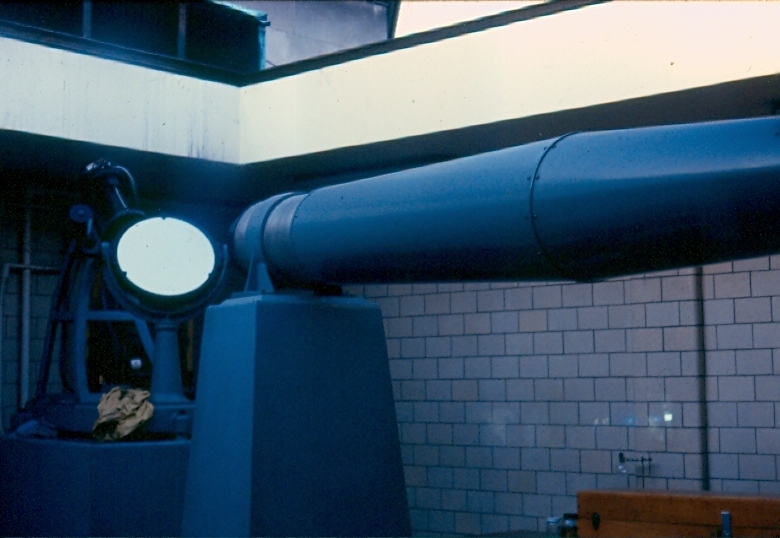 Through most of the 20th century, two large siderostat-type telescopes existed in the United States: a 15-inch refractor in suburban Philadelphia, and a 10-inch refractor at Pittsburgh's original Buhl Planetarium and Institute of Popular Science. Regrettably, at this time both are dismantled and in storage. The Philadelphia telescope, which was produced by Pittsburgh's John Brashear Company, is now in the possession of an amateur astronomer in Jacksonville, Florida. The Buhl Planetarium telescope, produced by the Gaertner Scientific Corporation of Chicago, may be reinstalled some time in the future in an expansion of The Carnegie Science Center. Do you have a source for that 1851 January 8 date? Alien 'Mega-Structure' Around Star KIC 8462852 ?